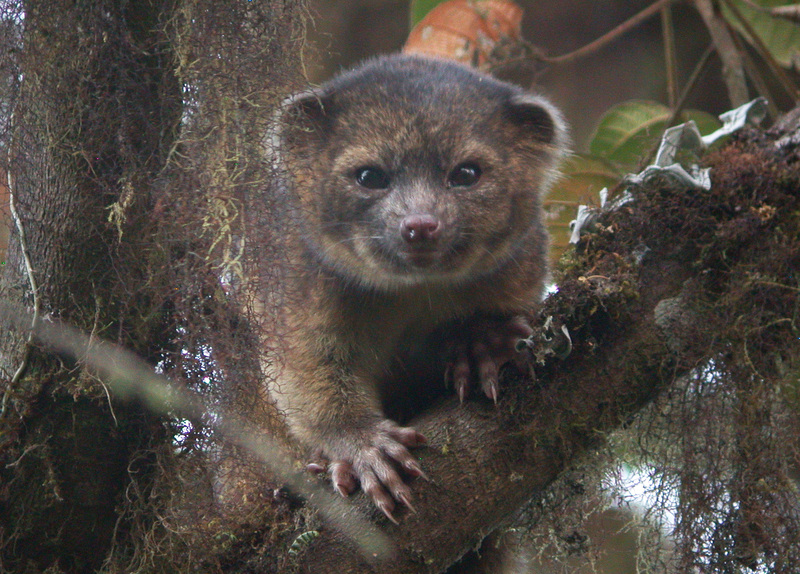 The olinguito is the smallest member of the raccoon family. It has thick, woolly fur that is denser and more colorful (orange or reddish brown) than its closest relatives, the olingos. Its head and body length is 14 inches long (355 mm), plus a tail 13-17 inches in length (335-425 mm), and it weighs 2 pounds (900 grams). Males and females are similar in size. 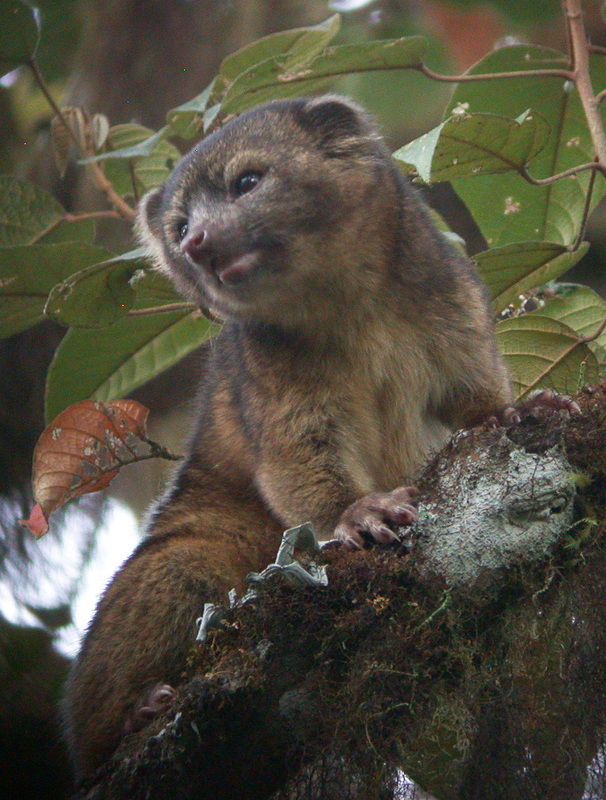 The olinguito mainly eats fruit, but may also eat some insects and nectar. These solitary animals live in trees and are mostly nocturnal. It is an adept jumper that can leap from tree to tree in the forest canopy. Mothers raise a single baby at a time. The olinguito is found only in cloud forests of the northern Andes Mountains, in Ecuador and Colombia, at high elevations (5,000 to 9,000 feet above sea level). The olinguito (Bassaricyon neblina) is the first carnivore species to be discovered in the American continents in 35 years. A team, led by Smithsonian scientist Kristofer Helgen, spent 10 years examining hundreds of museum specimens and tracking animals in the wild in the cloud forests of Ecuador. The result: the newest species of mammal known to science, the olinguito (Bassaricyon neblina). 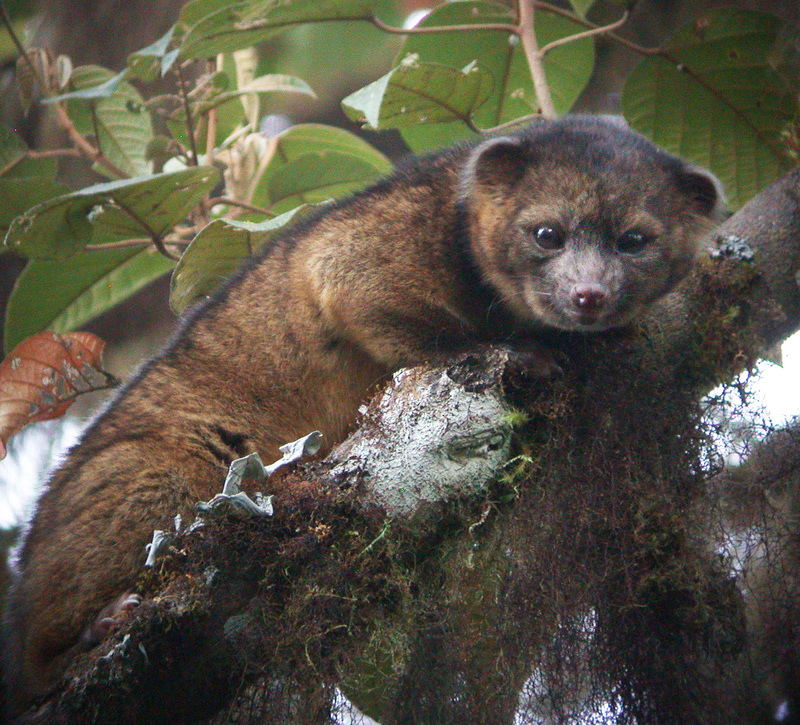 The olinguito (Bassaricyon neblina) came close to being discovered several times during the past century and was even exhibited in zoos. 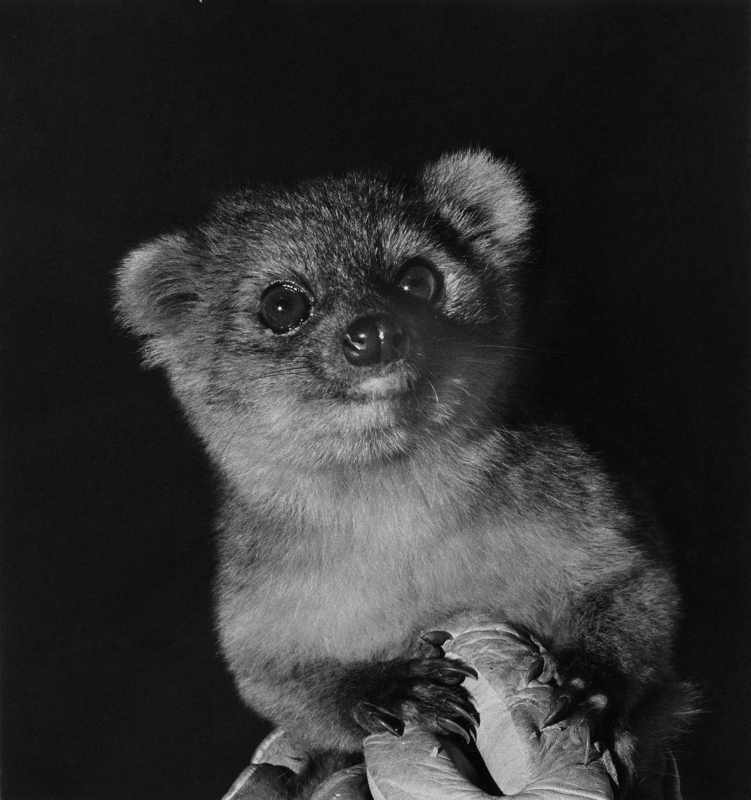 For example, this female olinguito lived in various zoos in the US decades ago. 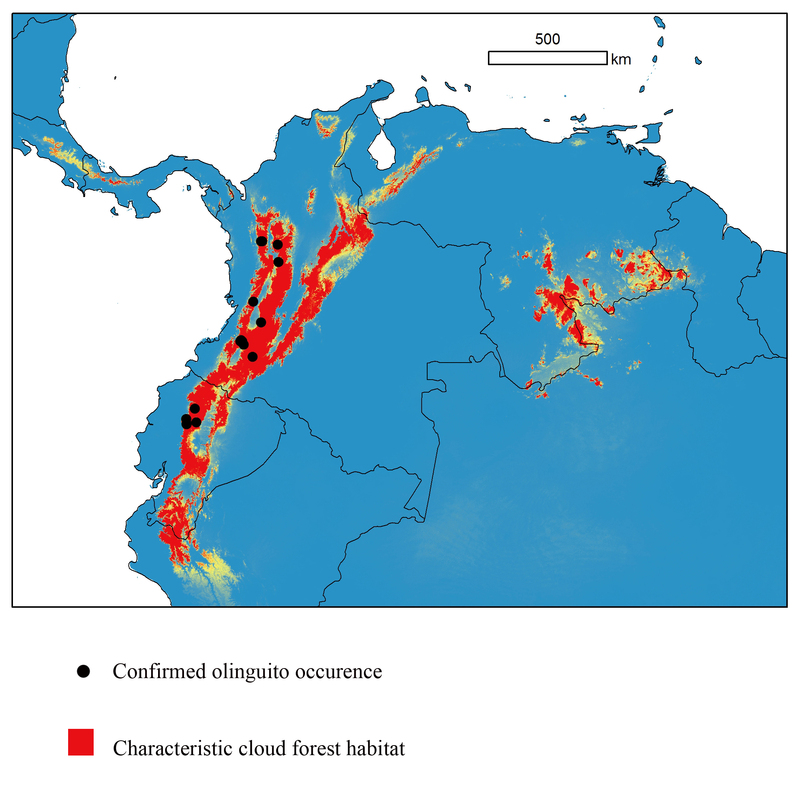 Olinguito distribution map. So far, the only known olinguito habitats are in the cloud forests of Colombia and Ecuador, but future research may show that they are also in similar habitats in other South American countries.